Mining companies around the world increasingly require formal permission and informed consent of local communities to access mineral resources. Community-level permission is often sought in the form of benefit agreements: documents that stipulate how mining companies will compensate local communities for the environmental and social costs of a mineral development project as well as share in the economic benefits. For the last one and a half years, CIRDI has been working closely with international communities to enhance their capacity in implementing community benefit agreements (CBA). Through our CBA project, CIRDI has worked with specific case-study communities to improve their understanding of CBA processes and to develop tools for improved CBA formulation and implementation. The project also targets some of the weak links in the global practice of CBA negotiation, implementation, and monitoring, and will result in a globally-relevant database, handbook, and analysis. 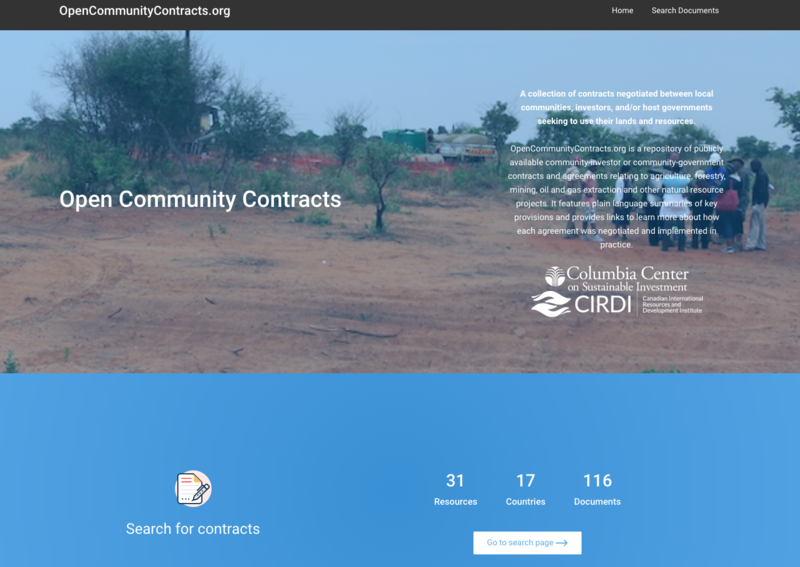 Through this project, CIRDI, in partnership with Columbia Center on Sustainable Investment (CCSI), has created an online repository of publicly available agreements between communities and investors: OpenCommunityContracts.org. The agreements featured in the repository include benefit-sharing agreements, leases, memoranda of understanding, and revenue sharing agreements concluded in the context of agriculture, forestry, mining, oil and gas extraction, renewable energy, and other natural resource projects. The repository features plain language summaries of each agreement’s key social, environmental, and fiscal terms, among others. Where available, agreement pages include links to studies or reports relevant to the agreement to provide further context. Having increased access to relevant information will enable communities in countries with extractive-dependent economies to increase their benefit from resources through improved negotiation and implementation of mining sector CBAs. Access to this online platform will enhance their capacity to successfully engage in designing and negotiating such CBAs, which should ultimately lead to more equitable benefit sharing in the long-run.